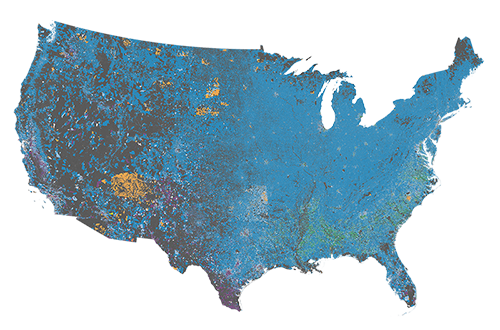 Mapping American diversity reveals not just a snapshot of today but the imprint of two and a half centuries of migration, conflict, and prosperity. Read the stories. Virginia had the most slaves of any state. After the Civil War, ex-slaves became sharecroppers growing cotton, sugar, and tobacco on land rented mostly from white owners. About 56.2 million acres, including remnants of ancestral lands, are reserved for Native American tribes forced to move by waves of new arrivals over four centuries. Settled by Spain long before the U.S. was founded, New Mexico is the only part of the nation where many Hispanics report their ancestry as Spanish, not Mexican. A large concentration of residents identify as Hispanic in California’s Central Valley and Washington’s Columbia River Valley. Both areas are major agricultural producers that employ many laborers. EPluribus Unum—Out of Many, One. The traditional motto of the United States encompasses the hope that different peoples can unite as one nation. Every 10 years, mandated by the Constitution, the U.S. Census Bureau conducts a tally to keep track of the populace. It parcels the country into some 11 million units, many as small as a city block, and endeavors to record the ethnic or racial character of the people within. Mapping this diversity reveals not just a snapshot of today but the imprint of two and a half centuries of migration, conflict, and prosperity. This story is part of Diversity in America, a National Geographic series covering racial, ethnic, and religious groups and examining their changing roles in 21st-century life.